We have reached a significant milestone in our own history with the publication of our 50th bulletin! Normally, the Bulletin is put on the website one month after publication. If you would like to receive the Bulletin by email as soon as it is published, please contact the Membership Secretary about joining the Lewes History Group, and to renew your membership at the start of the calendar year. The origins of the Dripping Pan in Mountfield Road are a mystery. A favourite theory is that it was once a medieval salt pan linked to the nearby Priory. What’s not in dispute is that it has been a popular sporting venue for several hundred years past. Since 1885 it has been home to Lewes Football Club, affectionately known as the Rooks. David Arnold paints a portrait in words and pictures of the Dripping Pan and some of the people and events that give it a unique place in Lewes history. As usual the meeting will be at the King’s Church building, Brooks Road, and all will be welcome. We shall be serving coffee and biscuits prior to the meeting. As part of the event there will be an exhibition of the results of the research so far, with documents, photos and information that the team have already collected. They are looking forward to sharing these with you. When: SUNDAY 14 SEPTEMBER 2014 FROM 11.00 a.m. to 1.00 p.m. There will be an LHG Research Group meeting at 7.30 p.m. on Monday 22 September in the small meeting room at the King’s Church building. The topic is dating old photographs from clothing styles. Booking is essential – five places left. Bring your own photographs – they must include people! This event is for members only. Book via the website or 01273 812456. Sussex Women. Six sessions on Thursdays, 2-4 p.m. led by Susan Kramer, starting 2 October. Course fee, £52. Guests of the Nation. A day school on Saturday 15 November led by Sally White, about the 250,000 destitute Belgian refugees who came to Britain after the start of the Great War. Course fee £15. A Day in the Life of a Monk at Lewes Priory. A day school on Saturday 7 March led by Graham Mayhew, based on the research for his recent book. Course fee £15. British censuses started in 1801, but systematic recording the names of all residents in each parish began only in 1841. However, the earliest census-takers calculated their totals by first listing inhabitants household-by-household, and a small number of these early working papers survive, usually amongst the papers of the parish overseers of the poor. One such example is St Michael’s parish, Lewes, where in 1811 the overseers listed the heads of each of their 139 houses, three of which were empty. 29 households were made up of two different families, and a handful housed three. 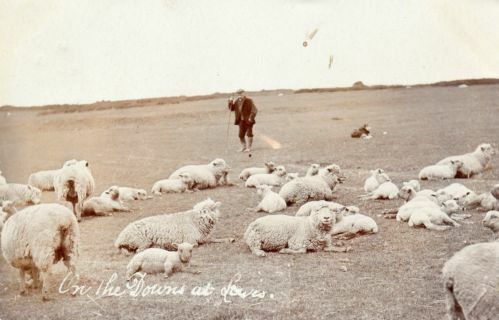 The overseers recorded the name of each householder (presumably for identification purposes), the number of males and females in their household, and the household’s occupation(s). The largest household in St Michael’s in 1811 was the ‘Poore House’, which contained 15 males and 16 females in a single family. Second came the first house on the list, headed by innkeeper Richard Hodd, comprising 8 males and 12 females. Richard Hodd was innkeeper of the White Hart. More than 20 households had 10 or more people. There were only 5 one-person households, while fewer than 10 contained only a couple. Large, crowded households were the rule. 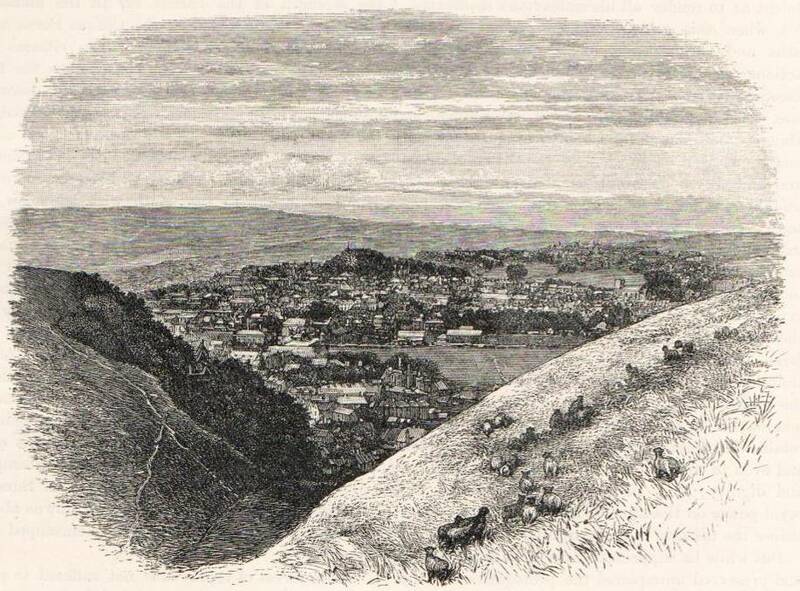 Source: This engraved print taken from the 1898 ‘Illustrated History of England’ was based on a photograph by Lewes photographer W.S. Branch. A copy of the print was offered for sale on ebay earlier in 2014. There were seven Anglican churches in Lewes in 1867. They produced seven rather different incomes for their incumbents, six rectors and a perpetual curate. The living with the lowest income, Southover, was held together with All Saints. St. Michael’s, High-street. The living is a rectory, yearly value £116, with residence, in the gift of the Lord Chancellor, and held by the Rev. Frederic Woolley, M.A., B.C.L. SS. Peter and Mary Westout, High-street, now called St. Anne’s. The living is a rectory, yearly value £190, with residence, in the gift of the Lord Chancellor, and held by the Rev. Augustus Parsons, M.A., of Trinity College, Cambridge. St. John’s-under-the-Castle, is in the vicinity of a small camp. The living is a rectory, annual value £250, in the gift of the Rev. C. D. Crofts, M.A., and held by the Rev. R. S. Grignon, B.A. ; the Rev. Alexander Levie is the curate in charge. All Saints, in Church-street. The living is a rectory, value £206 per annum, in the gift of C. Goring, Esq., and held by the Rev. John Scobell, M.A., of Balliol College, Oxford. St. Thomas-a-Becket, in High-street, Cliffe. The living is a rectory, value £130 per annum, in the gift of the Archbishop of Canterbury, and held by the Rev. J. C. Russell, M.A., of St. Peter’s College, Cambridge. St. John the Baptist, Southover, is a rectory value £97 per annum, with residence, in the gift of the Lord Chancellor. The living is held by the Rev. John Scobell, M.A. of Balliol College, Oxford, and rural dean. There were also ten non-conformist churches, six of them led by a resident minister. This photograph was taken by Terry O’Connor, who then lived at 18 Little East Street, and shows the junction between Little East Street and Eastgate Street before many of the houses there were demolished to accommodate the new Phoenix Causeway river crossing. The houses demolished included 18 Little East Street. 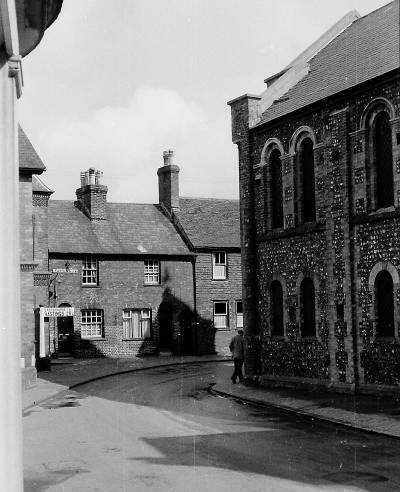 There is a side view of Eastgate Chapel, and if you magnify the picture you can read ‘Eastgate Street’ on the street sign. The fingerpost points the way to Hastings (via Cliffe Bridge and Cliffe Corner), but there do not seem to be many alternatives open to the driver. Thanks to Beverley O’Connor for drawing this photograph to our attention and to Terry O’Connor for permission to reproduce it. 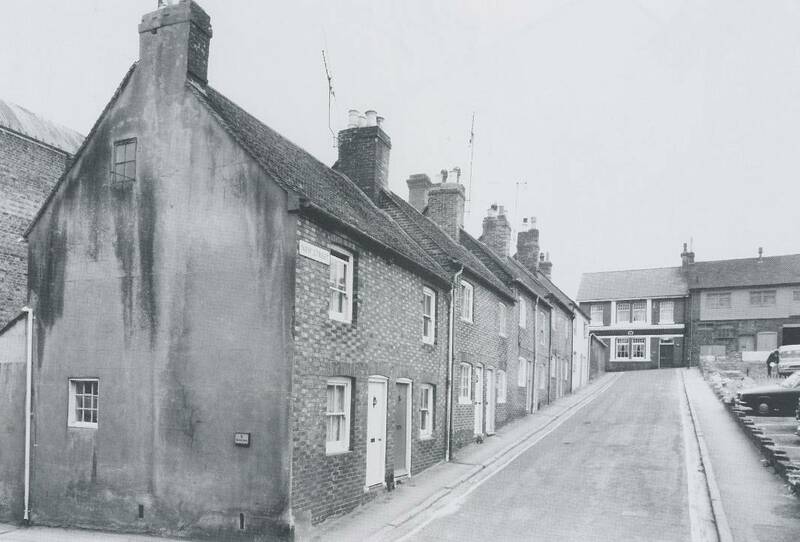 This photograph from Bill Young & David Arscott, ‘Lewes Then and Now, Volume 2’ (2004) shows the cottages on New Street that were demolished to extend the West Street car park. Broad’s candle factory, later Everett’s hypodermic needle factory, appears on the far left. This entry was posted in Ecclesiastical History, Lewes, Local History, Social History, Urban Studies. Bookmark the permalink.